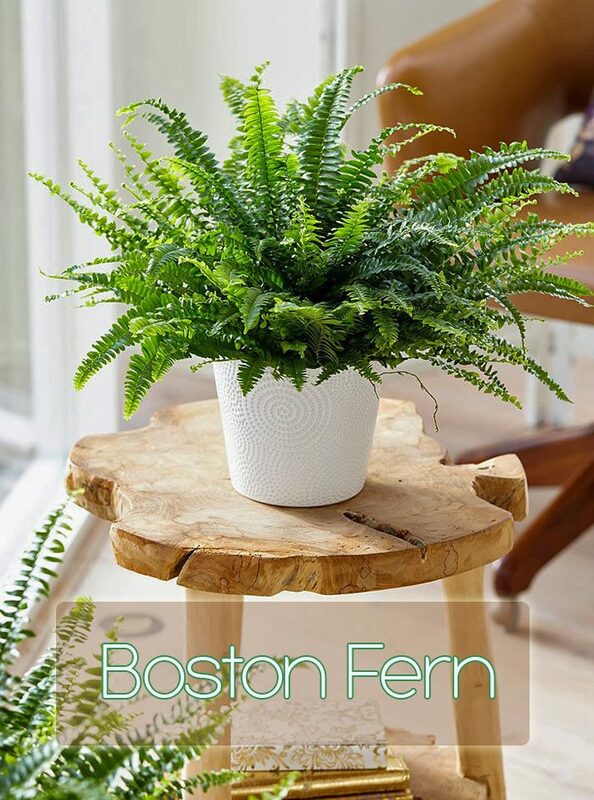 The Boston Fern is one of many ferns that is suitable for indoor use as a houseplant. If you want a reliable and fairly easy care fern then you need look no further than a variety of Nephrolepis. he Victorians were particularly keen on the early species such as N. cordifolia and N. exaltata, both of which tend to have stiff leaves or as they are more correctly known, “fronds”. 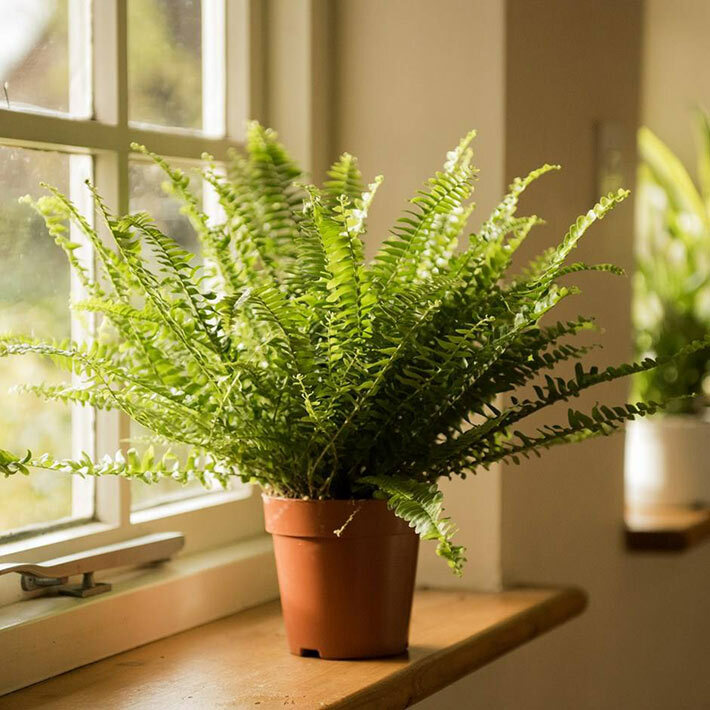 These days the more modern varieties such as the “Kimberley Fern” and of course the “Boston Fern” which was introduced in 1894, are much more popular due to their adaptability to our warmer homes (those Victorians liked the cold!). The Boston Fern has graceful green, drooping fronds that are naturally cut in such a way to give a ruffled looking effect and therefore it looks really good in a hanging basket or in a place where the fronds can hang down over something, for example on the edge of a bookcase or shelf. They’re quite sensitive to chemicals and the smoke from coal fires or wood burners are fairly toxic, draughts must also be avoided. 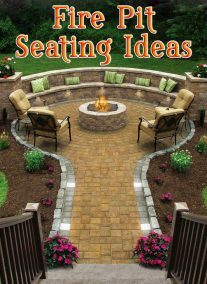 This means your choice of placement will need to be considered quite carefully if your home has any of these features. The Boston Fern is readily available, relatively cheap and is a great starter fern if you enjoy the lush green foliage and the feelings of peaceful tranquility they seem to evoke in people. It’s also one of the top rated plants for removing air pollutants from the air and because of its almost insatiable appetite for water it pumps out large amounts of water vapor into the nearby air, thereby increasing humidity. Reasonable light levels are needed. A Boston Fern will accept some full Sun and some quite shady areas, but for a happy and healthy looking plant you should aim for a fairly bright spot which does not receive harsh sunlight. A North facing window would be ideal. East (or West in a pinch) would be acceptable, but South should be avoided. All ferns are sensitive to watering routines and the Boston Fern is no different. The soil should be almost always moist in all seasons except for winter, during which you only need to water when the soil surface is dry. 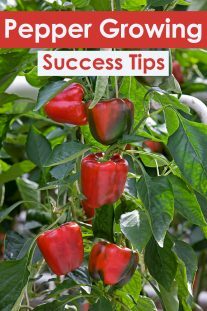 This means you could be easily watering this plant several times a week during hot weather. Moisture is great, but do not over water to a point where the soil becomes sodden and completely saturated. Try where possible to use rain water, but if you can’t provide this, tap water is okay, just make sure its been allowed to sit at room temperature for an hour because cold water can shock the roots. Boston Ferns do need a high level of humidity to really thrive. They absolutely love moist air, will accept average levels, but will suffer if humidity is low. Avoid placing near radiators or hot air vents which dry out the air considerably. This is the plant for the bathroom providing it has natural light and you can fit it in somewhere. Wherever it ends up, if practical mist the leaves regularly or check out some other ways to increase humidity. Feed using a general all purpose fertiliser at normal strength once every couple of months. 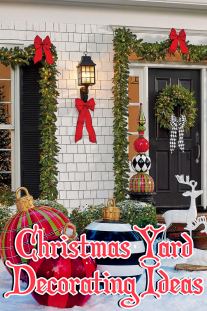 Warm to average warmth during the day with a natural decrease in temperature at night will work wonders on the foliage, 16°C – 26°C / 60°F – 80°F. In any case, no lower than 10°C / 50°F. Only repot if you are happy for the plant to grow bigger and even then, only when the roots have filled the existing pot. Take extra care to keep the fern at the same soil level it sat at before. It’s really important not to bury the crown as this will lead to crown rot and the eventual death of your plant. Some owners like to try and propagate by growing the spores which a healthy and mature fern will produce. This is quite complex and time consuming, in addition some plants sold as “Boston Ferns” are not actually pure species and thus the plant wont produce viable spores anyway. So it’s usually more productive to divide a large plant into 2 or 3 pieces when you repot, or a more reliable approach is to look out for “baby” ferns appearing on “runners” at the edges of the pot. After they are large enough to handle they can be cut away from the “runner” and potted up in a similar compost mix. Expect rapid and regular growth for much of the year when conditions are favorable. Growth will slow in cooler temperatures or if the roots have no where left to grow. A max height of 90cm / 3ft and a spread of 180cm / 6ft after many (many) years. Almost all houseplants have flowers of some kind, even if quite rare. Ferns are the exception. No matter what you do you will never get the Boston Fern to bloom. 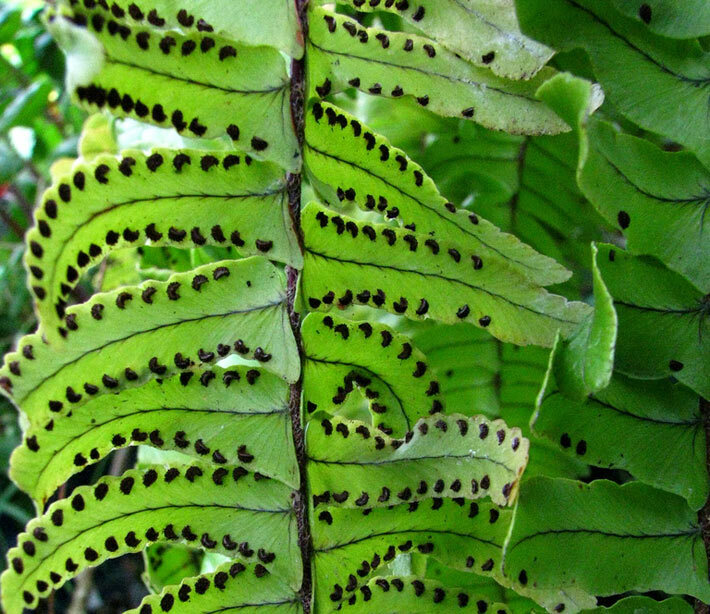 Instead you may find it develops brown spots or “spores” on the underside of the fronds . It’s really important you can recognise these as they are all too often mistaken for some sort of insect infestation, at which point the plant is either thrown away or its owner reaches for the insecticide and sprays the fern to death. It’s true they can look like Scale, but where as Scale will appear in a random pattern, spores appear in rough lines and in an easy to see pattern. (See photo right). 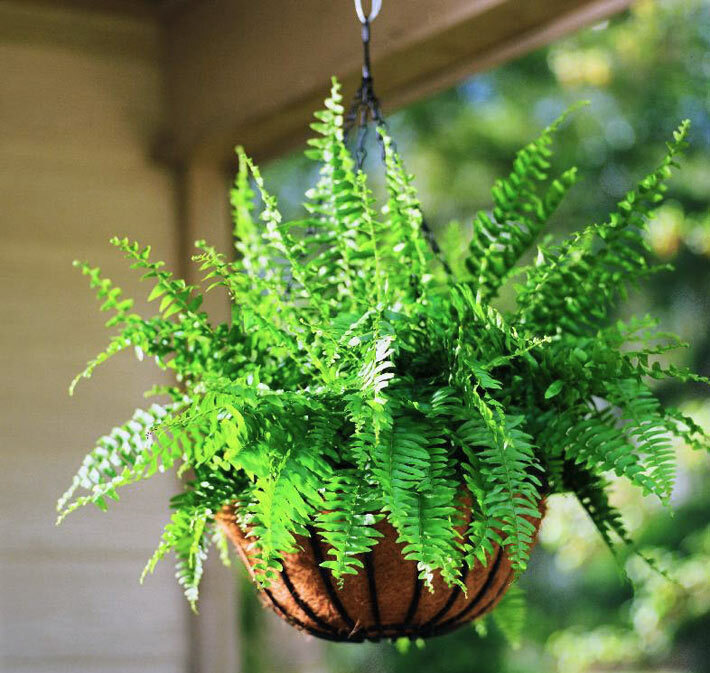 Is the Boston Fern Poisonous? The Boston Fern is non-toxic to people, cats and dogs. Due to the plants sensitive nature of chemicals (and because it’s too fiddly anyway) avoid leaf shine products. If you want to wash off any accumulated dust, run it under the shower for a few minutes. This is normal and shows you have a healthy plant! Scale can be a problem and so can Red Spider Mite if the air around the plant is dry. You don’t want an infestation of Scale as they are especially hard to remove from a fern as the plant itself doesn’t take chemical pesticides well. Therefore check the plant for these bugs every few weeks and remove the effected fronds completely or look at organic means of pest control. Red Spider Mite can be deterred by providing high levels of humidity (which the fern prefers anyway). In most cases this is a result of dry air, or allowing the soil to dry out too much before re watering. Annoyingly it can also be a indication you’re overwatering. The soil should be moist for much of the time, so think back over what you have been doing and adjust to better meet the Boston Ferns requirements. Cut the brown off as the green won’t return. ← Which Cardio Workouts Burn the Most Calories?